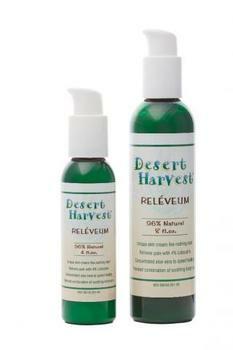 Desert Harvest of Hillsborough, N.C., is recalling 1,450 bottles of Desert Harvest Reléveum Skin Repair Cream. The bottles are not child resistant as required by the Poison Prevention Packaging Act, posing a poisoning risk if the contents are swallowed by young children. Desert Harvest Reléveum Skin Repair Cream is an over the counter skin cream with lidocaine (4%) as the active ingredient. It comes in a transparent green bottle with a white pump dispenser cap and a tan/white gradient label with “Desert Harvest Reléveum” printed on the front. The cream is sold in a 4-oz. or an 8-oz. bottle with the date code “D02N5” printed above the barcode on the bottle. The cream, manufactured in the U.S., is sold at Apotheco Pharmacy, Memorial Medical Center, Oschner Baptist Medical Center, Oschner Wellness, The Herb Bar, Current Medical Technologies, Be Well Pharmacy, Women’s Physical Therapy, other pharmacies nationwide, and online at Amazon.com and DesertHarvest.com from January 2016, through July 2018, for about $27 for the 4-oz. bottle and about $50 for the 8-oz..
Consumers should immediately place the recalled pain relieving cream out of the reach of children and contact Desert Harvest for a free replacement child resistant bottle cap. Consumers may contact Desert Harvest at (800) 222-3901 from 8 a.m. to 5 p.m. (ET) Monday through Friday or online at www.desertharvest.com for more information.